You might have seen your neighbor pick up a fancy-looking lock or had one installed at your workplace in order to beef up security. They certainly look more interesting and intimidating than your garden-variety tumbler lock, but how do keyless door locks work? Here’s all the basic info you need to unlock their mysteries. Mechanical + Electronic: How Do Keyless Door Locks Work? The way in which keyless locks secure the door they’re installed on is very similar to how it’s done when using the non-electronic kind. These are locks which activate a latch that bridges the gap between the doorframe and the door. They make use of spring bolts that hold the door in place until the handle is pushed down / the knob turned, or deadbolts which must be removed deliberately from one side. On top of this, keyless locks have actuators that connect to a motor housed inside either the door or the frame. Once the appropriate action has been taken, the motor springs into action, moving the bolt and granting access. Of course, that’s the result of successful lock activation, and that can be accomplished in a couple of different ways. Straightforward to understand but not always to remember, numerical codes are the most common method of entry. Locks which employ them have either a physical or virtual keypad you type the code into, and provided it’s the right one, the door opens. The codes range in complexity from four to eight digits or more. Depending on how advanced the lock is, it can store anywhere from ten to a hundred or more of these codes, and may have additional security measures in place like false codes where the actual passcode is sandwiched in-between random numbers to make it more complicated to guess. It’s only natural that security would spill over into the world of cellphones as these offer a convenient way of establishing contact with and manipulating the lock from a distance. The apps such locks come with range in complexity from glorified remote controls to sophisticated tools which allow you to open or lock the door from anywhere in the world, set a timer on the lock, issue and revoke entrance privileges on the fly, and much more. What all of these have in common is that they’re essentially replacements for traditional keys. You carry all of them around in a wallet or bag and take them out as needed. Fobs are tokens you place into contact with the lock to open it. RFID cards can either be made specifically for the lock, or existing ones like your credit cards can be set to act as keys. While all of them are as prone to misplacement or theft as regular keys, they do eliminate the need for an actual keyhole, making the lock physically more secure. 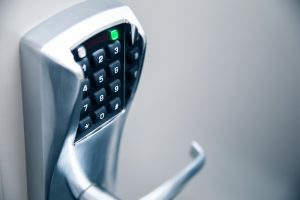 Long the stuff of sci-fi movies and high-security commercial use, biometric locks are now making a foray into the world of ordinary business and home security use as well. They use readings unique to each individual like fingerprints or retina scans when granting access. Their main advantage is the efficient restriction of people who may use them since biometrics aren’t nearly as easy to reproduce or steal as a set of numbers. They’re also very convenient as all it takes to get inside is pressing one’s finger on the appropriate surface. Most advanced locks make liberal use of two or more of these methods; however, some might also have a keyhole, just in case. It’s not uncommon to have to present a lock with both a valid code and a registered fingerprint to open it when it’s set to its maximum security level. As with any new technological development, it will take some time for keyless door locks to become universally accepted. Currently there are also compelling reasons that suggest some of them might not be that much more effective than regular ones to begin with, at least as far as security is concerned. In any case, it’s undeniable that they’re slowly but surely making the keys we grew up using go the way of the dodo. Whether that’s altogether a good thing remains to be seen.